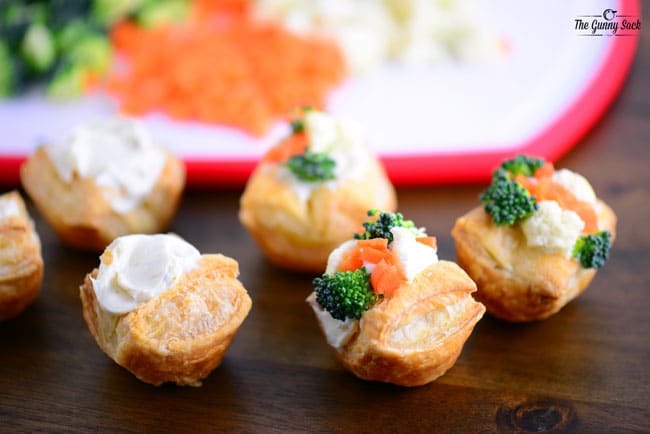 Veggie Pizza Puffs are a bite-sized take on the classic veggie pizza. 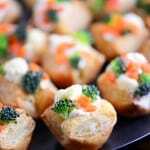 This easy appetizer recipe is a great way to use up leftover veggies. Veggie pizza is a classic appetizer that often appears at parties and family gatherings. 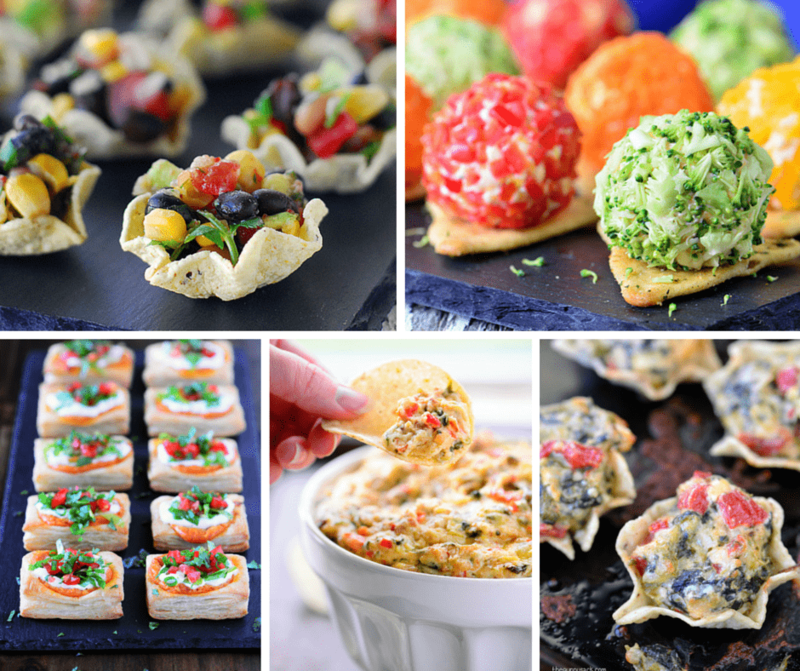 It is a versatile appetizer and can be made so many different ways. The crust can be made of anything from crescent rolls to pizza dough to puff pastry or you can even skip the crust altogether. A veggie pizza is a great way to get in a few extra veggies and you can use whatever you have on hand, the more colorful the better. The “pizza sauce” can also be customized and flavored to fit whatever you are craving. 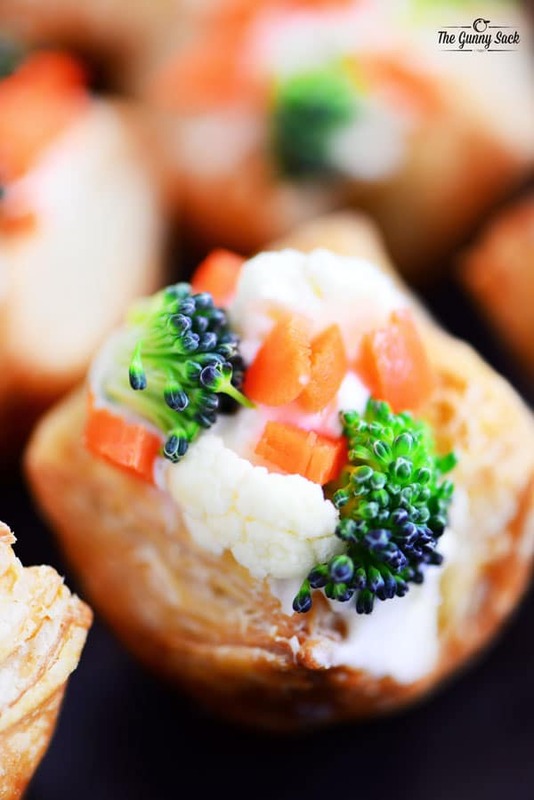 These Veggie Pizza Puffs are made with puff pastry, broccoli, carrots and cauliflower and have a ranch dip for the spread. 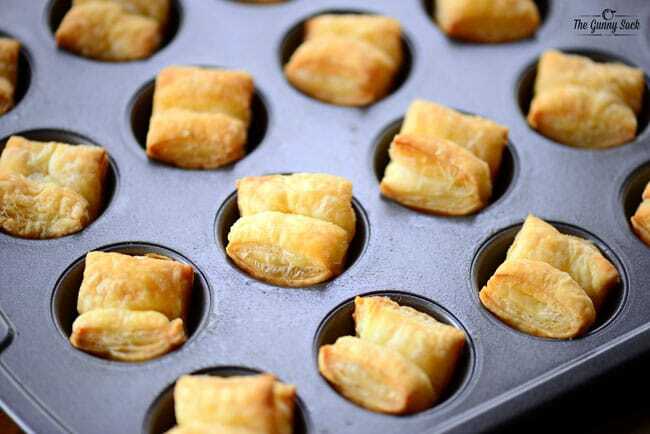 Cut a sheet of puff pastry into 24 squares. 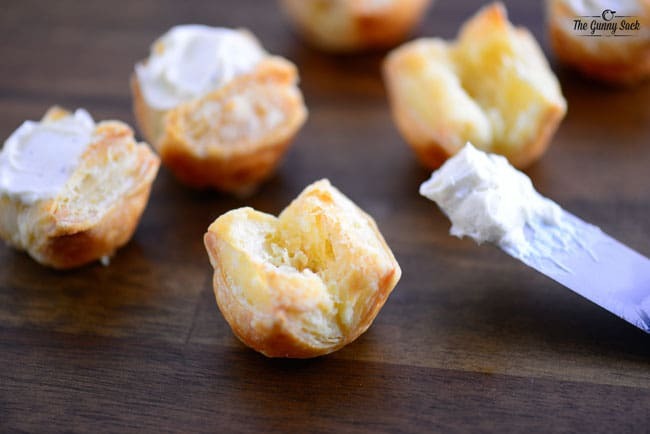 Beat softened cream cheese. Add sour cream, mayo, powdered ranch dressing mix, garlic powder and Worcestershire sauce. Beat well. 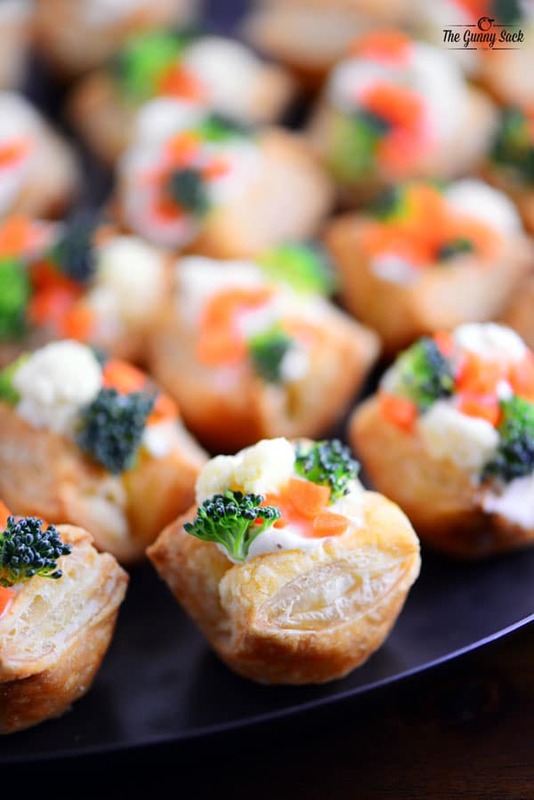 Cut the centers out of the mini puff pastries and fill them with the cream cheese mixture. Place the veggie pizza puffs on a tray. Store in the fridge until ready to serve. Serve cold. 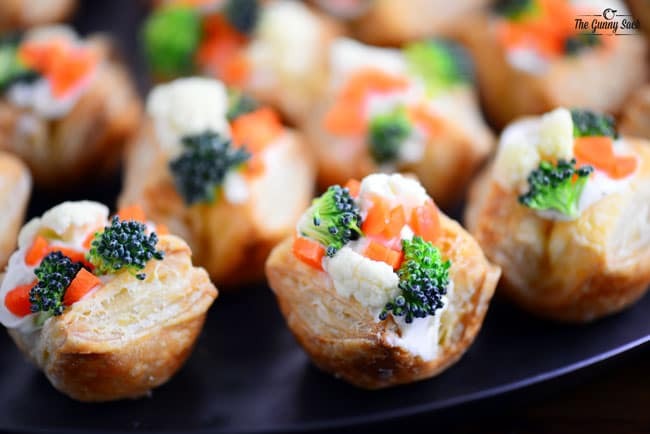 Let your kids add their favorite chopped vegetables to these Veggie Pizza Puffs and they will love this bite-sized snack. Cut the puff pastry into 24 pieces. 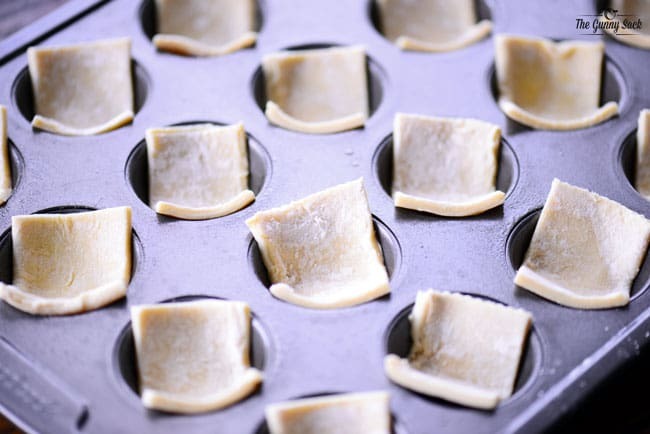 Press the pieces into a greased mini muffin pan and bake at 400 degrees for 15 minutes. 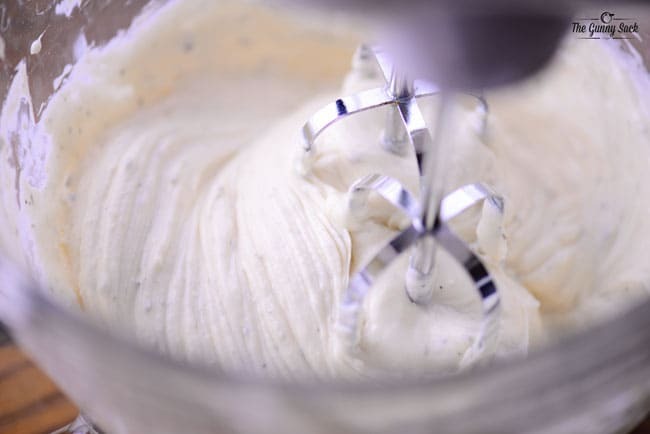 Beat the softened cream cheese until smooth. Mix in the sour cream, mayonnaise, ranch, garlic powder and Worcestershire sauce. Store in the fridge until ready to serve. Serve cold. Can you make these the night before? 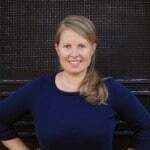 If so refrigerate or do not cover at room temperature. Yes, they can be made the night before and yes cover and refrigerate. Enjoy! What a great idea! These are so cute. Pinned! These are adorable and look like the perfect recipe to add to my sister’s baby shower I am planning! Ahhh I adore veggie pizza and you just made it even better if that was possible! LOVE!